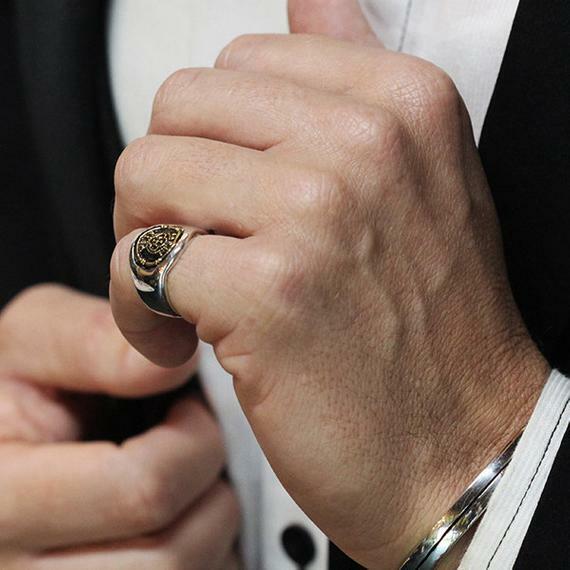 Men’s Pinky Rings: 10 Options We’d Like to See on Our man’s Pinky Finger! A man’s pinky ring has been historically known to convey different meanings. In the Victorian era when men wanted to indicate that they were uninterested in pursuing marriage a man would wear a ring on the pinky finger of his left hand. Pinky rings have also been known for being worn by members of the Mafia. This ring would act as powerful symbol whereby it would indicate the persons position within the organization. 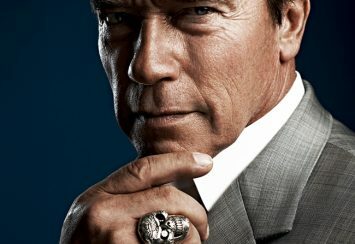 Traditionally there has also been a massive connection between a man’s pinky ring and his family/ heritage. The ring has been used to represent the man’s family crest or coats of arms. Historically the man’s ring would be dipped in wax to seal a document or letter by stamping it with his piece of jewelry. Signet rings have traditionally been given to the oldest son of a family as a present on their 21st birthday. It is still worn by men who have a strong social status and allegiance to tradition. A pinky ring has been associated with being worn by members of the royal family in particular Prince Charles who is known for wearing a signet ring on his left hand which is stacked on top of his wedding ring. 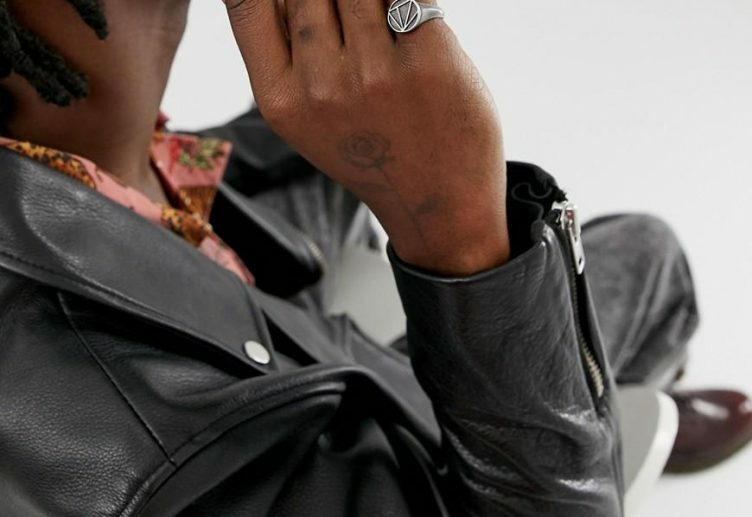 The pinky ring therefore plays a big part in communicating style, statue, affiliation and spirituality. The piece of jewellery has historically been worn by a variety of different types of men and still is today. Members of the royal family, wealthy society, rock stars, spiritualist and men who don’t believe in marriage – the list is endless. This is what makes the pinky ring so great because it’s extremely versatile and continues to develop in design over time! Smooth, stylish and sleek – these words would best describe this modern take on the classic pinky ring! This piece is definitely one of a kind! 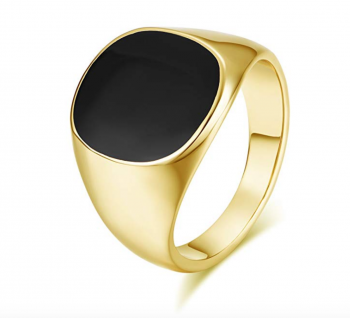 The ring has been designed with a modern vibe to it. Instead of having the classic flat oval head this designer has opted for a flat rectangle shaped head. It has a smooth brushed surface that gently curves to join the rings band. The flat top surface also features a stylish detail consisting of two black lines indented into the top surface. This detail definitely gives the ring an edgy look and feel which we love. It has been created using a black plated titanium material which has a brushed and resin inlay finish to it. The choice of titanium makesit very strong and extremely durable – great for wearing every day! The brushed finish on the outer part of the ring gives this piece a great finish. The inner surface of the ring also has a smooth and shiny surface giving this ring a lovely comfortable fit. It is approximately 10mm wide which also helps making this piece of jewellery extremely comfy to wear. When it comes to aesthetic qualities it has heaps of it! We’ve already touched upon the fact that it has a striking brushed finish giving this piece a ‘wow’ factor. Next, the ring models a modern detail consisting of two rows of resin inlay which give it heaps of originality and definitely bring it up to the 21st century! It is hypoallergenic making it suitable to wear if you have sensitive. It also comes in a cute ring box and the jeweller offers a 100% money back guarantee if you’re not completely pleased with your buy, however we don’t think this will happen! When it comes to the price of this item it is being sold for a low price by Metal Masters Co. which we think is a fantastic buy! If you’re looking for a slightly chunkier option for your man then this modern pinky ring may be exactly what you’ve been looking for! This option consists of a smooth, flat and shiny square shaped ring face that joins onto a thicker band. 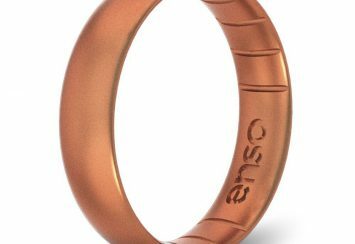 When it comes to the structure of this piece the designer has chosen to feature an effortless join from the face to the ring band which makes it almost look like a seamless loop. These design choices aid in giving it a very modern feel to it. Continuing the new modern feel, it has a high polished finish with a shiny and attractive surface. Touching the surface you’ll really notice just how smooth the outer surface of the ring actually is. 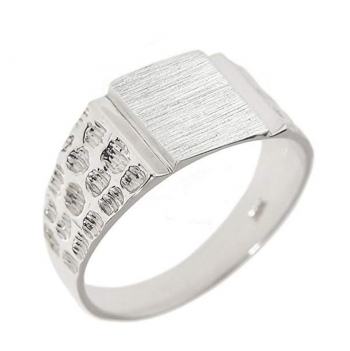 The inner surface of the band has also been designed with a smooth high polished finish making this a very comfy fit! This piece has been crafted using a high quality stainless steel material. What’s great about this material is that it’s very durable and looks great at the same time! 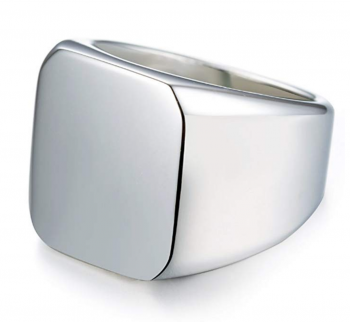 The silver stainless steel also gives this piece a stylish finish which any young man would love. The designers of this gorgeous ring are Van Unico who are selling the piece of jewellery for a very low price. This stylish piece will also arrive in a velvet bag and comes with a 30 day money back guarantee. What more could you ask for? Taking you back to a more classic and iconic pinky ring we’ve decided to feature this men’s option in the line-up of the 10 best pinky rings! The best way to describe it would be simple, stylish and elegant. When you look at this pinky ring it may remind you of something your grandfather would have worn or it may be looks like something you’d see in the window of an old jewellers. Well, this piece of jewellery may have an old style to it but it’s certainly not out of date. This vintage style signet ring is definitely in style and bang on trend! There’s no doubt about that. This classy option has been designed using gold stainless steel for the foundation of the ring. This gold steel has a lovely polished finish to it and has an extremely smooth surface. 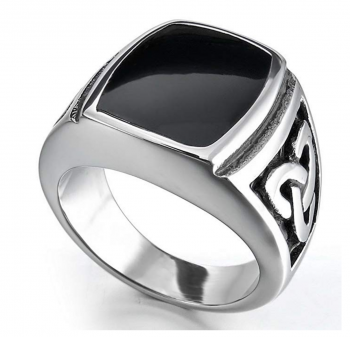 The iconic part is the black onyx circular face which is the prominent element of this ring. The combo between the gold stainless steel and black onyx look great together and give this pinky ring a timeless classic feel. This vintage ring would make the perfect gift for your brother, father, son, boyfriend or husband. This piece of jewellery has been created with a very minimalistic design, so if you like the sound of that you’ll love this piece. When it comes to the size, this piece is approximately 1.5cm high by around 2.1cm wide. The inner surface is extremely smooth making it very comfy. This classic ring will also arrive in a stylish ring box that is bright red which means you definitely won’t be misplacing this ring or its box. Another gold favourites of ours it this option which comes in 18k gold stainless steel. This gorgeous piece has been designed with a blank flat square shaped face. The stainless steel has a lovely smooth shiny finish to it. The designer has chosen to go for a high grade durable stainless steel which is 100% hypoallergenic making it suitable for people to wear who have sensitive skin. This stainless steel doesn’t rust and won’t fade which is great news. The ring is also scratch resistant. To give you an idea of the size of the piece it is approximately 0.67inches wide and weighs approximately 16g. It is very solid and sturdy as well as having a high polish finish. The band has a brushed inner surface making the material very smooth and comfy to wear on a daily basis. What’s lovely about this piece of jewellery is that it can be personalised by engraving the top surface. Whether it’s your name, initials or a special date this ring would make a really special gift to give to the man in your life! If you don’t like gold it’s also important to point out that this men’s pinky ring is available to purchase in a silver or black colour for the same low price, making it a fantastic buy! 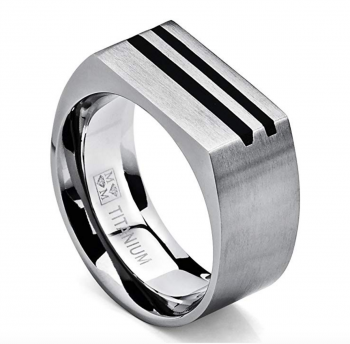 If shiny silver is your preferred metal to wear then this monogram ring could be the perfect pinky ring for your man! It has been designed to feature a small circular flat head which is joined to a silver curved band. We’d definitely describe it as cute! The foundation of the ring has been created using a high quality sterling silver and has a double rhodium overlay to the piece giving it that extra high shine and durability. What’s great about it is that it can be customized. 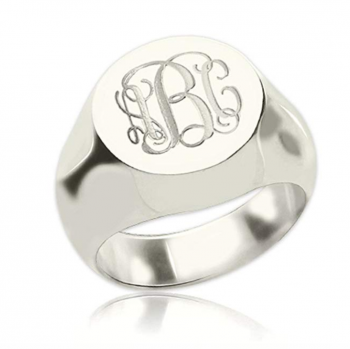 You can actually personalise the ring with any monogram initial you’d like. This is one of the qualities that make it a lovely personalised piece of jewellery to give to someone you love! Another thing that we like about it is that its suitable for people to wear who have sensitive skin. It’s also supper comfortable to wear with its ultra smooth inner band surface, giving it a snug fit that you’ll simply love! This special piece of jewellery comes with a cute box which means you won’t have to worry about gift wrapping the item because it’s all done for you! It is also available in other materials including gold and rose gold. You’ll be pleased to hear that the jeweller offers a 30 day money back guarantee on this ring. Once again it is being sold for a fantastic low price which means you won’t break the bank with this purchase. Take a look for yourself today! 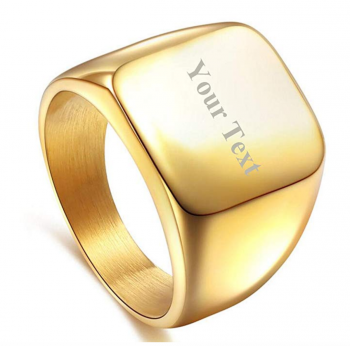 If you love to wear a bit of gold, check out this interesting gold stainless steel pinky ring. If your man loves being outdoors in nature then he may also appreciate this vintage style tree piece of jewellery. This is very much a classic piece with a twist to it. There’s no getting away from the unusual design, on the ring face. 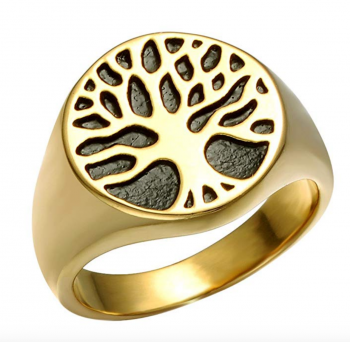 The foundation is made from a sold stainless steel gold that features a tree style design which has been cut out of the stainless steel to reveal an earthy looking tree. The way this pattern has been achieved is quite remarkable. Instead of adding the pattern to the surface of the gold stainless steel this designer has actually chosen to cut into the material to reveal this one of a kind pattern. To give you an idea of the size of this design it has been cut to a size of approximately 1.6cm by 1.6cm and the piece weighs approximately 10g. There are lots of qualities about this piece which we can’t stop talking about! Firstly, the high polished gold stainless steel. This material is solid and extremely durable. The metal is free of lead, nickel and is hypoallergenic, meaning it’s safe for people to wear who may have sensitive skin. The gold plated stainless steel has a long lasting colour retention which means it will stay looking beautiful for longer! The outer and inner surface is extremely smooth and offers the wearer a very comfortable fit. The material used achieves in giving this piece a much loved vintage vibe. If you prefer silver over gold the jeweller sells this ring in a different material for a fantastically low price. The piece of jewellery comes in a cute black velvet pouch, keeping it nice and safe. They also offer a 90 day warranty with this ring but we doubt you’ll need to use this! Check out their website for more details. 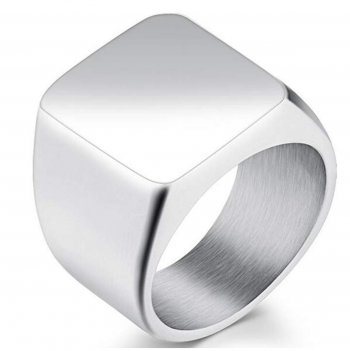 This stainless steel silver signet ring is very minimalistic. 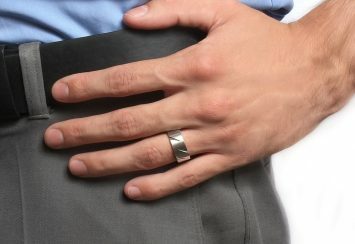 If you’re a man that prefers the less is more look then this ring may be exactly what you’ve been looking for! The designer has chosen to create this piece by using a stainless steel metal, making this piece very durable and let’s not forget, extremely shiny! It has been given a polished inner and outer surface, giving the ring a very smooth and comfortable finish. You definitely won’t want to take this it off your pinky finger! The ring’s band is approximately 10mm wide adding to the comfy fit. When it comes to the face the designer has opted for a flat square shaped face which gives off a very masculine feel. With no engraving or frills on this ring’s face, the designer has chosen to make it all about the shape and material used to create this stylish piece. They really have gone for the less is more appeal and it’s definitely paid of . We simple love it and hope you do too! What makes it even more appealing is that its nickel free and hypoallergenic and comes with a life time warranty. It is also available to purchase in a range of materials including black rhodium, rhodium, gold plated and oxidized stainless steel. The piece is also being sold for a great price so get it now! Celtic designs can transform a piece of jewellery from something very bland to something quite decorative. Celtic designs have been around for years and they continue to give a piece of jewellery like a ring a lot of depth and much needed personality, take for instance this option. The designer of the piece has opted for a black onyx on the flat square shaped head. The band then effortlessly curves to join the face and features a decorative Celtic design – representing a black Celtic knot. What is interesting about this piece is that normally a Celtic design which is featurede on a piece of jewellery, like a ring, is much smaller. The pattern would normally be quite delicate and intricate but this jeweller has opted for the complete opposite! Instead the Celtic knot takes up the entire height and width of one side of band, transforming the ring into a statement piece. The foundation has been created using stainless steel enamel. This material makes the piece of jewellery very durable, meaning that it is hard wearing and less likely to get damaged when worn on your pinky finger. The stainless steel material gives it a grey dull tone that would be best suited on the finger of possibly someone like a musician or an artist. The style and vibe that you get from it is that it should be worn by a creative person that prefers wearing something more out of the box and doesn’t mind getting their hands dirty. It will arrive in a cute little black velvet pouch giving you somewhere safe to store it when it’s not being worn. The price is extremely low, you’d have trouble getting a ring for a lower price than this one! This is definitely a statement piece particularly when it comes to the texture and pattern on the ring. If you like your jewellery to be unusual then this option is quite unique! The main foundation has been created using a sterling silver material. What’s special about this piece of jewellery is that it’s been handmade by an expert team of jewellers. It has been designed in three sections, a flat square ring face that has a rough scratchy looking texture to it which almost gives the silver a grainy feel to it. It then looks like a bend has been made to the sterling silver prior to it moving into the rest of the band. This bend creates a 90 degree angle, giving the band an interesting design quality. When it comes to the band this has circular engravings throughout the band, giving it an interesting surface texture and pattern to the silver. Altogether the designer has opted to feature quite a lot of pattern and texture to the surface of this silver ring making it very interesting to look at and wear! There are many reasons for loving this option! It can be personalised, allowing your initials, a letter or symbol to appear on the flat face. This ring would be great as a gift because it can be personalised to whoever you’re giving it to. It also comes with a free special gift packaging so you won’t have to worry about doing this yourself because the jeweller has taken care of this for you, making your life easier. The piece of jewellery is also being sold for a low price, making it a fantastic buy for the man in your life! 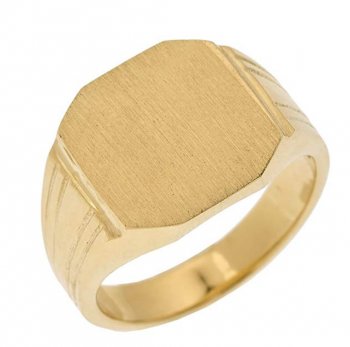 We just had to feature this yellow gold octagon shaped ring as the final option in our list! The shape definitely makes it a statement piece and one of a kind. It has been created using a 14k yellow gold material. The top has been cut into an octagon shape, making it quite unusual to the eye when comparing this ring to the traditional shape of a ring. The gold piece has been given a lovely polished finish to it and has a straight line grained texture to the surface. This particular ring doesn’t feature anything on the top surface of ring, however, this statement ring can definitely be personalised. Whether it’s your initials, name, a symbol or some other special engraving, upon purchase you can opt to have this men’s ring personalised by the seller. The piece also arrives with free gift packaging so if you are thinking of giving this to someone as a gift the hassle of getting it gift wrapped will be sorted all for you! When it comes to the price, it is being sold for a very high price by Men’s Signet Rings so if you have a large budget to spend this could be the perfect option for you to splash out on someone special or treat yourself to.